This inherited connective tissue defect affects the heart with enlargement of the aorta - the large vessel that carries blood from the heart to the body's tissues. This enlargement occurs near the aortic valve (2 in diagram) - where the aorta leaves the heart - and may also affect the part of the aorta (1) that carries blood to the body (the ascending aorta). 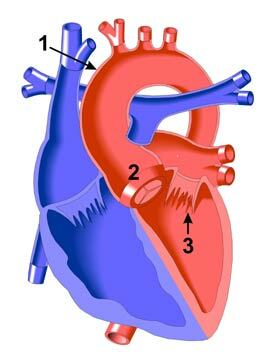 There may also be abnormalities in the structure of the aortic valve and/or the mitral valve (3), which connects the left atrium and left ventricle. Marfan's Syndrome (also known as arachnodactyly) is named for Dr. Antonin Marfan, who first described this condition in 1896. It is caused by a genetic defect involving the body's connective tissue and occurs in approximately 1 of every 10,000 people.